These works formed the templates for the thousands of horror stories that followed and have been frightening and thrilling readers for the past two centuries. This ebook compilation also includes more than 150 illustrations by Sidney Paget, Lynd Ward, Arthur Rackham, F.O.C. Darley, Harry Clarke, Gustave Doré, and others. 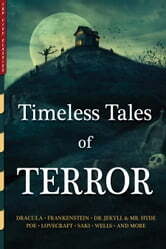 So turn the lights down low, curl up in an easy chair, and enjoy these Timeless Tales of Terror. Maybe lock the doors and windows, just to be safe.